Blood poisoning triggered by Staphylococci – the process. Blood poisoning is an infection of the blood i.e. the presence of microorganisms or their toxins in the blood resulting to disease otherwise known as septicemia/bacteremia. This is dangerous because bacteria and their toxin can be carried to the entire body. If left untreated it can progress to sepsis which is very fatal. The bacteria can travel to vital organs such as brain, heart and lung causing organ failure. 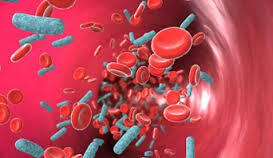 Septicemia is caused by an infection in other part of the body, when bacteria from there gain access to the blood stream, multiplies and spread over the body. Common infection includes: Urinary Tract Infection, Lung Infection (Pneumonia), Kidney Infection and Infection in the Abdominal area. Also, a person with severe injury; burns or immunocompromised is at high risk. When diagnosed very early, septicemia can be treated effectively with antibiotics. Research efforts are focused on finding out better ways to diagnose the condition earlier as there are few options for diagnosing and treating the disease. Septicemia can be caused by several pathogens depending on the infection but one caused by Staphylococcus aureus leads to thousands of deaths each year in Germany alone. The peculiarity of Staphylococci comes from the fact that it does not contain endotoxin, hence, how it causes septicemia is unclear. Unlike other pathogens mostly Gram-negative that forms endotoxin molecule which causes septicemia. The way the infection begins and how it leads to multiple organ failure was not well understood until recently. Researchers at the University of Tübingen's Interfaculty Institute for Microbiology and Infection Medicine (IMIT) and the German Center for Infection Medicine (DZIF) headed by Dr. Dorothee Kretschmer, Dennis Hanzelmann and Professor Andreas Peschel already uncovered a major cause of this life-threatening condition. Has published in the latest issue of Nature Communications, the result of their study shows how exactly Staph. does this. The researchers have now shown that lipopeptides play a key role in triggering the disease and that certain staphylococcus bacteria form additional molecules - known as PSM peptides - which release these lipopeptides. Infections caused by PSM-negative staphylococci are also common, but these staphylococci do not release lipopeptides and hardly set off septicemia in experimental infections. Knowing that only certain staphylococci release PSM peptides may help doctors to better assess how dangerous a patient's Staphylococcus strain may be. It will also enable them to develop new treatments to prevent the formation of PSM and lipopeptides, thereby avoiding severe cases of blood poisoning.